The notion of GDP of an economy has become a familiar one. Yet it is of fairly recent vintage. It was developed by Simon Kuznets for a US Congress report in 1934, and “refers to the market value of all final goods and services produced within a country in a given period. GDP per capita is often considered an indicator of a country’s standard of living,” as the wiki explains. A nation’s income is what the nation produces over a specified period. 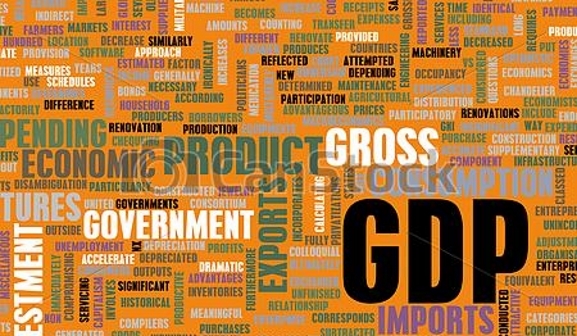 GDP is an aggregate measure of economic activity and it should not be taken as a comprehensive measure of social well-being or happiness or any such abstract notion. GDP is to a nation what a person’s annual income to a person. While personal income is an indicator of how economically successful a person is, it does not define the person in any comprehensive way. But knowing that a person is doing well economically tells us whether he has the necessary material wherewithal to live a decent life or not. Note that material well-being is a necessary but not a sufficient condition for the good life. This holds true for a country also. If the GDP is below a certain threshold, it is unlikely that the people are prospering. One of the features of the modern world is that GDP grows with time. GDP growth is a recent phenomenon, actually. Over pretty much the entire existence of human civilization, there was scant progress in the material standard of living. From generation to generation, people lived pretty much like their ancestors did. Only after the Industrial Revolution (mid-1700s) did things change – and changed astonishingly rapidly compared to the past. Instead of things improving at the rate of 0.01 percent or so annually, the average long term rate of growth of the production of stuff (goods and services) began to be in the low single digits. That’s a rate two orders of magnitude higher than before the Industrial Revolution. The implications of that higher growth rate are impossible to overstate. It is hard for us to get our minds around the idea of exponential growth. We have to do the arithmetic, and in some cases even after doing the sums, the results still strain belief. So let’s do the numbers. Let’s do an exercise that compares the actual with a counterfactual. Start off with India’s estimated annual per capita GDP of $250 (in 2010 US$) in 1947. I assume the population of India in 1947 to be 350 million. How accurate are these numbers? They are ballpark figures, and even if they are off by 10 or 20 per cent, our exercise is robust and the conclusions do not critically depend on the starting numbers since we are more interested in estimating magnitudes rather than exact figures. To continue doing this exercise for years 3 through 62, we use a spreadsheet. Starting with $250 as the per capita GDP at year 1, at 2.1 per cent growth rate, by year 62, we get a per capita GDP of $900. If year 1 is 1947, year 62 is 2009. That looks reasonable. The 2.1 per cent per capita GDP growth rate we used gives us approximately the actual per capita GDP of India in 2009. The assumed annual population growth rate of 2 per cent is also reasonable since a population of 350 million in year 1947 grows to around 1.2 billion in year 2009. So now we have for each year from 1947 through 2009, estimates of population and per capita GDP. Multiplying those numbers gives us the total GDP for each of the 62 years. For example, for 2009 the GDP of India works out to be $1.061 trillion, which is the product of 1.2 billion population and $900 annual per capita income. Finally, we add up the annual GDPs for those 62 years to get a great big number: the estimated actual aggregate GDP 1947-2009. It is $24.5 trillion (in 2010 dollars.) This number is an approximation of how much income Indians produced (and earned) over that period. Now we do the counterfactual part of this exercise. Redo the numbers but with one difference: instead of a 2.1 per cent growth rate of annual per capita GDP, assume 6 per cent. We do the numbers again. We find that we get a per capita GDP of $9,300 in the year 2009. That is the per capita income of a middle-income country. That’s an order of magnitude higher than the $900 number. With 6 per cent per capita GDP growth rate, the aggregate GDP works out to be $143 trillion. The difference between the estimated actual cumulative GDP of $24.5 trillion and the counterfactual $143 trillion is a mind-blowing $120 trillion. What does it mean? What are the implications? Is 6 per cent growth of per capita GDP possible for such an extended period? What would have been possible given that? What about poverty? Global power and influence? What about the impact on the lives of hundreds of millions of people? The next part of this series will explain all that.